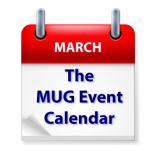 Dave Hamilton of The Mac Observer will visit a Connecticut group to talk mesh networking, and is at the top of this week’s MUG Event Calendar. An examination of Affinity Photo and Design will be done at an English group, Skype will be talked about in Florida and digital photography will be covered by an Australian group. Tuesday 28-Mar Internet Macintosh User Group (Australia) – ‘Photography for everyone’ – Frame rates, focus and F-stops are no longer required!